There are a number of prophecies and allusions to Christ the Messiah throughout the Old Testament. Think about that. God, in His infinitely glorious wisdom, had wonderfully planned the salvation of all peoples through the person and work of Jesus Christ–the only Son of God, God in the flesh. Ephesians 3 calls this God’s “manifold wisdom.” He wrote His great plan of salvation to save people in Christ “before the foundation of the world” (Ephesians 1:4-5). From the days of Adam, to Noah, to Abraham, to the prophets – God’s grand story of salvation was being written. 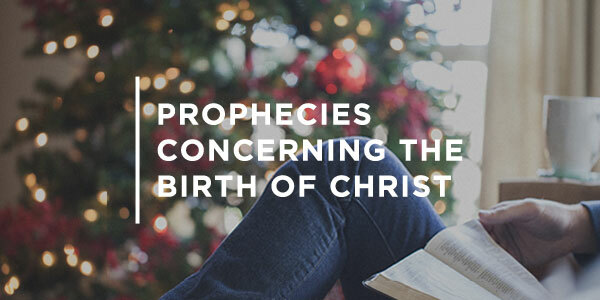 Below are a few of the Old Testament prophecies concerning the birth of Jesus Christ. Worship as you read them. But you, O Bethlehem Ephrathah, who are too little to be among the clans of Judah, from you shall come forth for me one who is to be ruler in Israel, whose coming forth is from of old, from ancient days. Therefore he shall give them up until the time when she who is in labor has given birth; then the rest of his brothers shall return to the people of Israel. And he shall stand and shepherd his flock in the strength of the LORD, in the majesty of the name of the LORD his God. And they shall dwell secure, for now he shall be great to the ends of the earth. For more study resources like this, please visit our Christmas resources page.